Arduino is awesome. The boards are solid, the programming language and IDE are easy, and the community is awesome. But for a lot of electronics projects, an Arduino is overkill. If you're just blinking a few LEDs, and reading a single sensor, you can get the job done smaller and cheaper using a simple IC, like the ATtiny85. The Tiny AVR Programmer is a general AVR programmer, but it's specifically designed to allow quick-and-easy programming of ATtiny85's (as well as 45's) compared to the pocket AVR programmer. It has an on-board socket, where the little 8-pin IC can be plugged in and directly programmed. 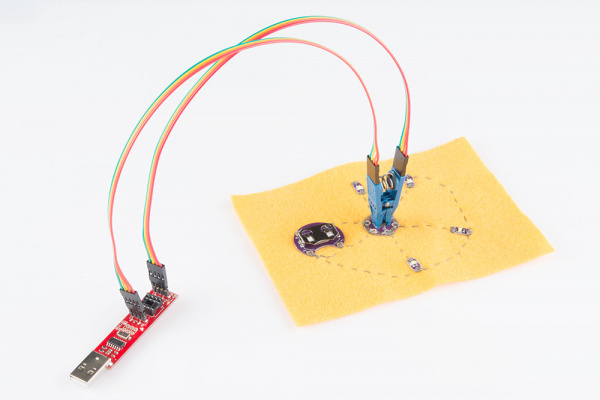 No messy wires or soldering required! Once you've programmed the ATtiny85, just remove it from the Programmer, and stick it into a breadboard or prototyping board. The Tiny AVR Programmer can also be used as a general purpose AVR programmer. It can directly program almost all AVR's (including the ATmega328 and ATmega32U4) whether they're on Arduino boards or in a breadboard. In this hookup guide, we'll show how you can program ATtiny85's using the Tiny AVR Programmer and Arduino. We'll cover everything from driver installation to Arduino programming tips. ATtiny85 -- To be programmed by the programmer. Remember, you can also use this to flash other AVR chips like the ATtiny84! A free USB Port. A USB hub should work too. USB Extension Cable -- If your USB port is out of reach, this may help make the Programmer easier to reach. IC Test Clip - SOIC 8-Pin -- If you are using a surface mount ATtiny, this handy dandy little clip makes it easy to program the microcontroller! Jumper Wires Premium M/F -- Useful if you are connecting the Tiny AVR Programmer to another AVR microcontroller that is not the ATtiny85 or the IC Test Clip. Installing Arduino -- You'll need Arduino installed for the Programming in Arduino section of this tutorial. There is an ATtiny85 addon for Arduino, which enables you to program the tiny AVRs in the familiar Arduino interface. Integrated Circuits -- This tutorial goes over the basic concepts of integrated circuits. 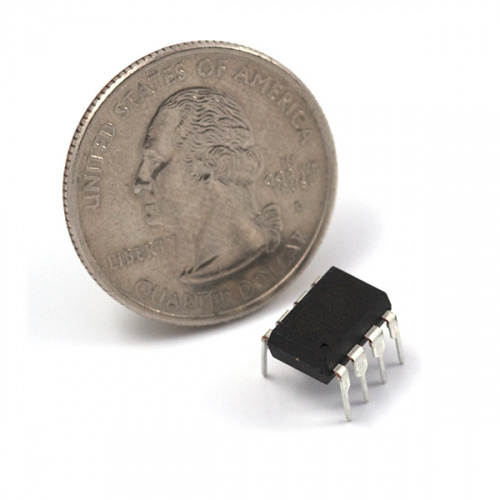 The little black chips that the Tiny AVR Programmer is designed to program. Polarity -- Specifically the Integrated Circuits section. You should know all about IC notches and dots. The "brain" of the Tiny AVR Programmer is an ATtiny84 (not to be confused with the 85), -- the 16-pin surface-mount chip -- which comes preprogrammed with some firmware that makes it look like an AVR programmer. Unless you're writing custom AVR ISP firmware, you shouldn't ever have to mess with this chip. It's a black box. Program data comes into it from your computer, over USB, and it spits out the proper sequence of bytes to load that program into your ATtiny85. In this tutorial, we'll mostly concern ourselves with the components on the right half of the board. The ATtiny85 programming socket, pin 0 LED, and prototyping pins. The socket and the pins broken out to the sides are what make the Tiny AVR Programmer unique. The 8-pin socket fits both the ATtiny85 and the ATtiny45 DIP packages. Just plug your IC-to-program into this socket, and a-programming you will go! A Tiny AVR Programmer with an ATtiny85 inserted. When plugging your ATtiny into the socket, take note of the notch on both the socket and the white silkscreen on the PCB. This should match the polarity of the ATtiny85. Usually the ATtiny85 has a dot next to pin 1 of the IC, this should be placed up towards the notch. The +, -, and numerical labels on the side of the socket reference the pin numbers and voltage supply inputs of the ATtiny85. These pin numbers can be called in the Arduino IDE as we'll show later in this tutorial. The 4-pin headers on either side of the socket help for prototyping the ATtiny85 out to external circuitry. You can easily plug male jumper wires into these pins, which can be routed to breadboards or other prototyping circuits. An ATtiny85 being prototyped out to a potentiometer (analog input), button (digital input), and RGB LED (analog/digital output). The 4-pin headers can also be used to connect to surface mount ATtiny85&apos;s or other AVR microcontrollers that are on breadboards. Tiny AVR Programmer connected to an surface mount ATtiny85 that was sewn on fabric to reprogram a LilyTiny. Finally, there's an on-board amber LED connected to pin 0 of the ATtiny85. This is super-helpful when you're uploading the "Hello, world" blink sketch to an ATtiny85. That covers the fundamental stuff on the Tiny AVR Programmer. If you plan on doing more advanced stuff with the board, or just want to know more, feel free to read on. Otherwise, skip ahead to the next page. The Tiny ISP Programmer is not limited to ATtiny85's. It's a full-fledged AVR programmer. This row of six pins can be connected to other AVRs via the standard 2x3- or 2x5-pin ISP headers. You could, for example, connect these pins to your Arduino Uno, Leonardo, etc. to re-flash a bootloader, or upload code using a programmer. Just match up the labels on the Tiny Programmer to the pins on your AVR board/chip, and get ready to program! There are two jumpers on the top side of the Tiny AVR Programmer: one is labeled RST and the other is VCC. Both of these jumpers affect the unpopulated 2x3 ICSP (in-circuit system programmer) header in the middle of the board. Unless you're planning on reprogramming the on-board ATtiny84, these jumpers and pins can generally be ignored. The VCC jumper is normally closed. It controls the flow of power to the VCC pin on the ICSP header. When closed, power from USB will flow to the ICSP header. When open you'll need to supply power externally to that pin. The RST jumper is normally open. When closed, this jumper connects the ATtiny84's reset pin to the to the 2x3 programming header. If you ever need to reprogram the ATtiny84 (which, for standard use cases, you shouldn't), you'll have to close this jumper to enable programming it. Enough talk. Let's start using the programmer. On the next few pages we'll cover driver installation (for Windows users) and show how you can use the Tiny AVR Programmer to program an ATtiny85 in Arduino. Before you can start using the Tiny AVR Programmer, you may need to set it up on your computer. If you're using a Mac or Linux machine, you don't need to install drivers. Just plug the board in, and skip to the Programming in Arduino page. If you're using any version of Windows, you've got a few steps to follow before you can join your Mac/Linux comrades. There are two sets of instruction for driver installation on this page. The first is the easiest, quickest method, and should work for most everyone. The second installation process is only required if the first one fails -- it takes a more manual approach to the driver installation. For more information, check out our tutorial on reprogramming ATtiny85&apos;s on the LilyTiny and LilyTwinkle. If the programming pins are broken out on a standard 2x3 ICSP header, you could also solder together the ISP pogo adapter to temporarily connect to the chip. Or you could grab a few alligator test leads or IC hook to individually connect each programming pin to the Tiny AVR Programmer&apos;s machine headers. This is a 10-pack of wires that are pre-terminated with an alligator clip on one end and a male header on the other. Now that you've successfully got your Tiny AVR Programmer up and running, it's time to incorporate it into your own project! Schematic -- A PDF of the Tiny AVR Programmer's schematic. Eagle Files -- If you want to look at the PCB design, or modify it to make a version of your own, check these files out. Tiny AVR Programmer Firmware -- If you want to dig into the code that lives on the Programmer itself, check this out. GitHub Repository -- Go here to find the latest, greatest version of the Tiny AVR Programmer's hardware and firmware. Or modify it and contribute your changes back! Arduino Board Definitions -- The attiny folder should live within a hardware folder in your Arduino sketchbook. 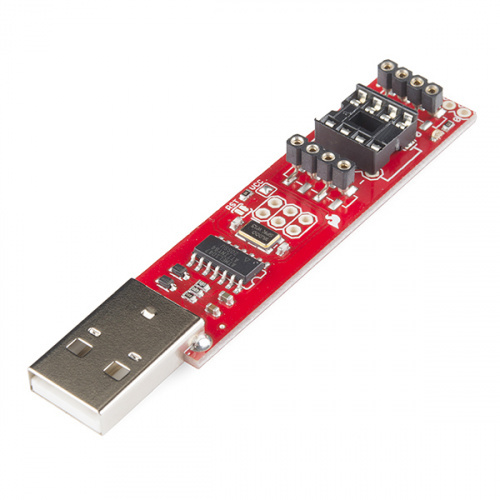 Atmel Documentation Page -- The latest datasheets and application notes for the ATtiny85. High-Low Tech Tutorial -- An overview of programming the ATtiny85 using Arduino. Pocket AVR Programmer Hookup Guide -- If you are interested in using the Tiny AVR Programmer to program other AVRs with AVRDUDE via command line, this tutorial will provide a few examples and troubleshooting tips. Just make sure to connect to the respective ICSP pins. Are you looking to use a Pi to flash larger file sizes to your AVR microcontrollers? Try checking out the Pi AVR Programmer Hat!